AbraPol-30 is an advanced, semi-automatic machine for grinding and polishing of specimens in specimen holders. Double dosing of diamond suspensions and lubricants ensures best distribution and thus an optimal utilization of the consumables. AbraPol-30 is designed for laboratories or workplaces carrying out testing of large specimens or a high volume of specimens. 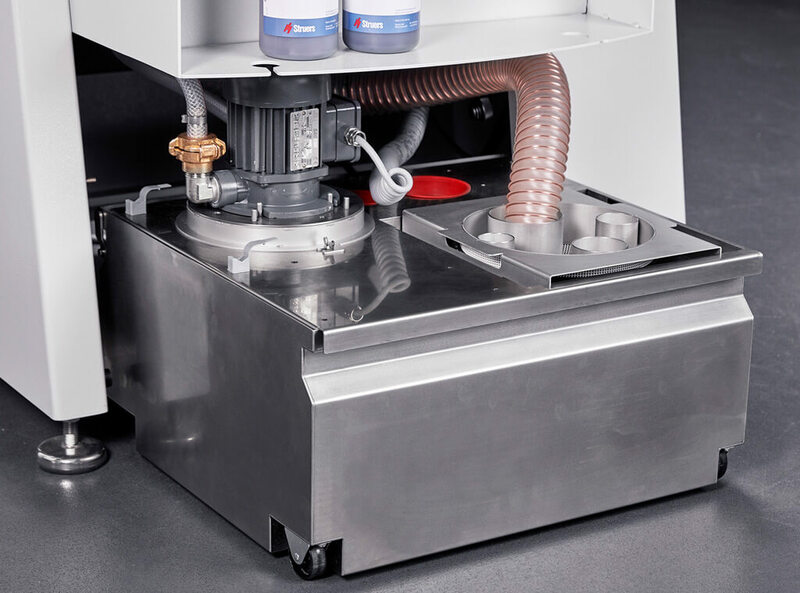 AbraPol-30 grinding/polishing machine features a unique double dosing of diamond suspensions and lubricants for the best distribution. The double dosing system makes the machine eminently suitable for preparing specimens on up to 350 mm/14” dia. discs using a 200 mm/8” dia. specimen holder. Consistent preparation procedures are required to ensure repeatability and reproducibility. 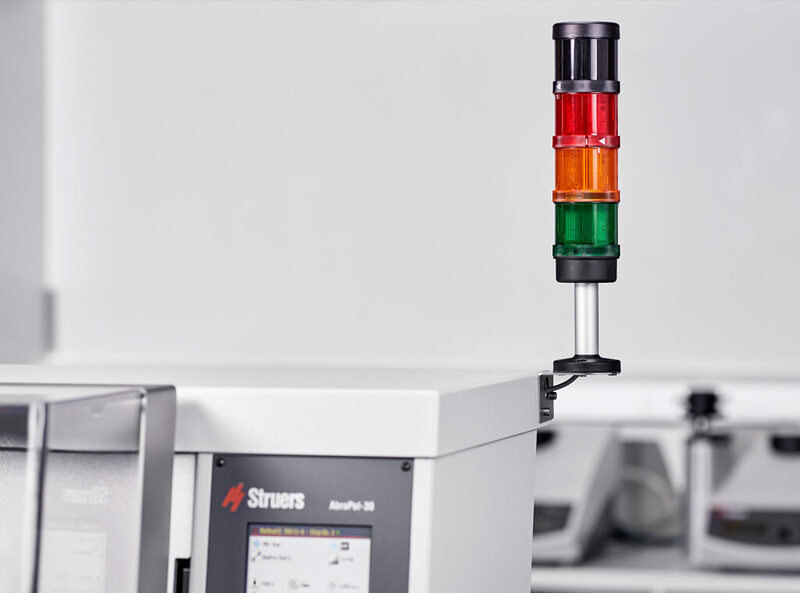 AbraPol-30 includes 10 Struers Metalog Guide methods, which cover all major material groups. They are developed for maximum performance and allow the operator to get started right away. They also provide an excellent starting point for development of own methods. AbraPol-30 includes a method database able to store as many as 200 preparation methods. 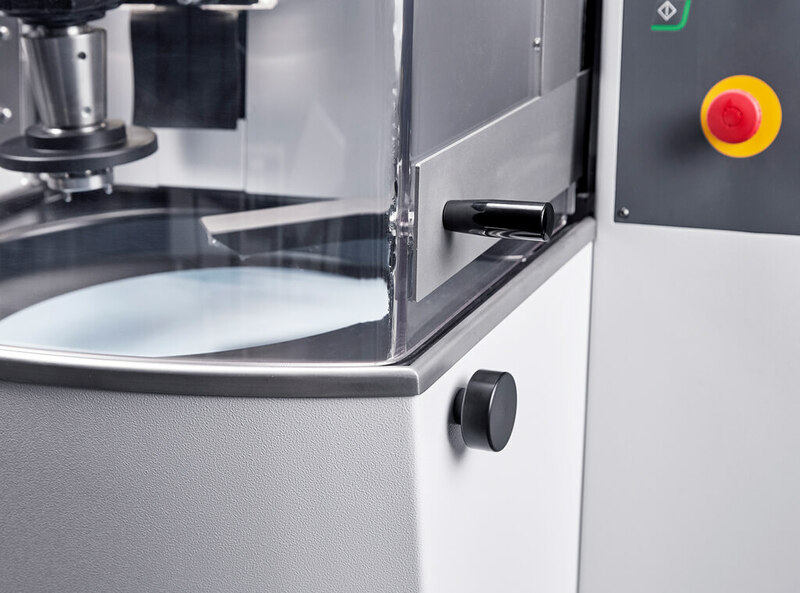 AbraPol-30 is characterized by an exceptionally stable and robust design with an extremely solid frame for reproducible grinding/polishing and powerful motors. The design limits vibrations, which supports the ability to work with large and heavy specimen holders many hours a day. See the AbraPol-30 in action. AbraPol-30 is designed for both 300 and 350 mm (12” - 14”) dia. discs, and to active the best distribution of suspensions and lubricants, these are dosed via two dosing nozzles. To obtain equal quantity from the nozzles the DP-Pump unit contains two pumps, one for each dosing nozzle. 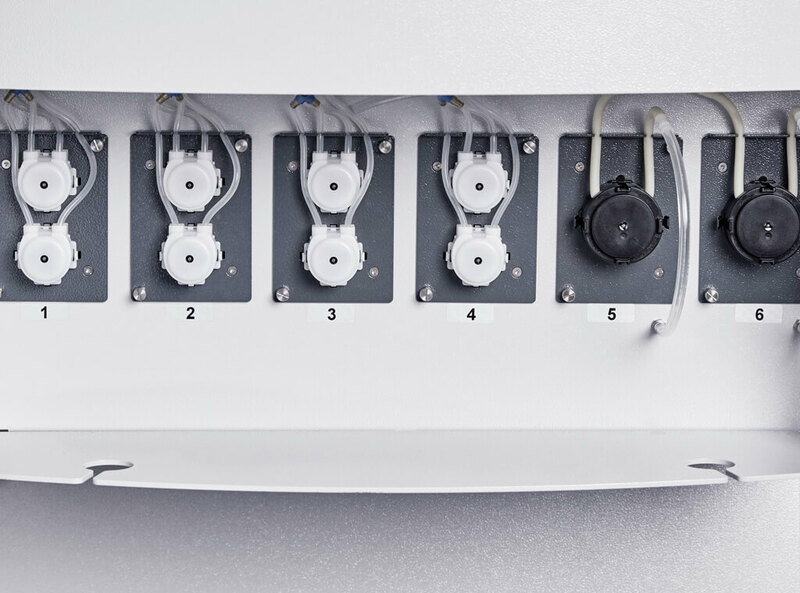 AbraPol-30 can be equipped with up to six individual Pump units to cover all purposes. Up to six DP-Pump units can be mounted and maximum two of them can be replaced with a OP-Pump unit. The OP-Pump unit is special because the tubes are cleaned with water after end preparation to avoid clogging of tubes and nozzles. Specimens can sometimes be lost during the preparation and can damage the bowl. 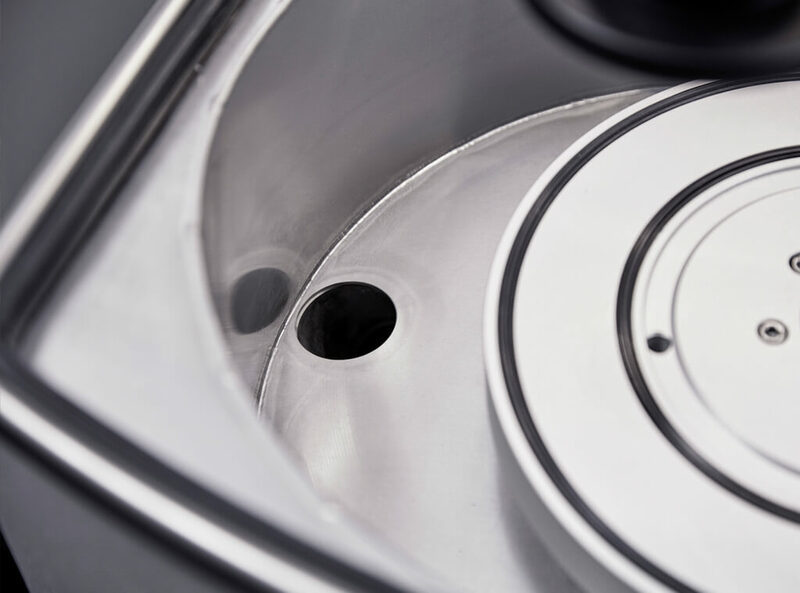 To avoid breaking the bowl we have decided to produce it in a corrosion resistant high-quality stainless steel for greatest strength and safety. To underline quality, it comes with a lifetime corrosion warranty on breakthrough corrosion. A special AbraPol-30 disposable bowl liner for easy cleaning of the bowl is available. AbraPol-30 is equipped with a sensor to accurately measure the material removal. Using the material removal instead of time can in many situations be a huge advantage. In the case of small specimens, there is a risk of too much material being removed, while large specimens or hard materials may hardly be touched. A recirculation cooling unit can be connected for cost-efficient water utilization when grinding and to collect removed abrasives. Struers recirculation unit is integrated into the machine with easy access for maintenance and control of the cooling water. 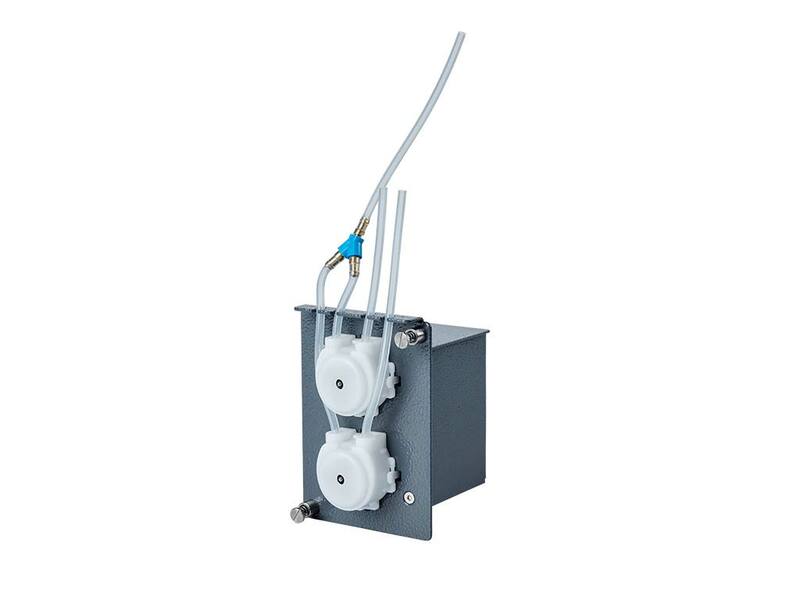 The three phases recirculation pump is connected directly to the AbraPol-30 resulting in that the emergency stop also controls the recirculation pump. Both disc and specimen holder rotation speed can be adjusted for either very careful or fast preparation. 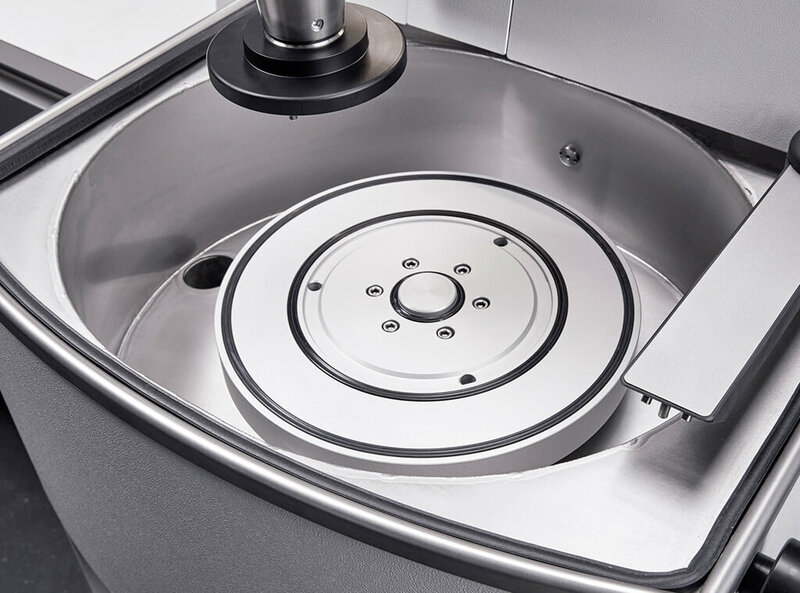 The disc speed can be set from 40 – 600 rpm and specimen holder speed from 50 - 300 rpm. AbraPol-30 features a strong, transparent safety cover for maximum operator safety. The safety cover keeps fumes inside the machine and is noise reducing. 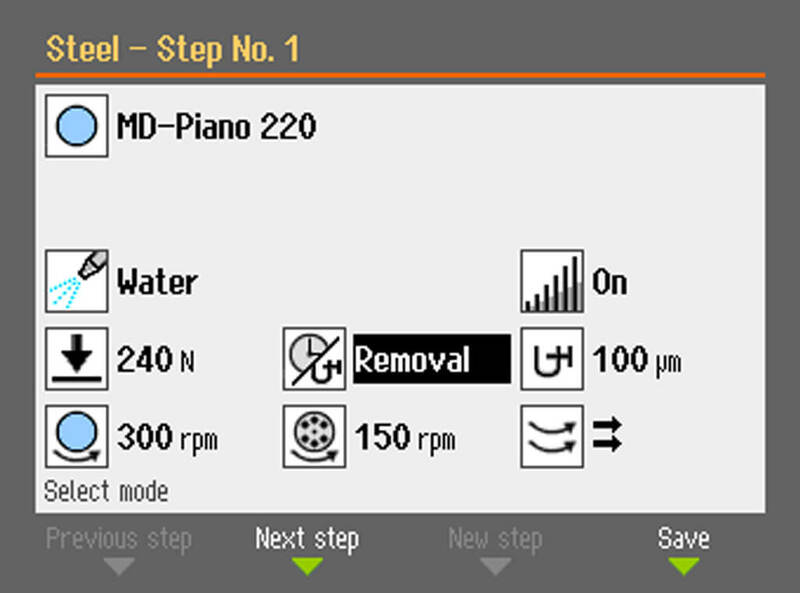 In manual mode, the preparation disc can turn without the safety cover locked. Otherwise, the machine cannot be started before the cover is closed. The cover can only be opened again when the machine has stopped completely. AbraPol-30 features an emergency stop, which stops all machine functions when engaged. The working environment can be improved by connecting the machine to an external exhaust system via the built-in exhaust tube for safe extraction of fumes, e.g. from alcohol-based consumables. AbraPol-30 is very easy to operate, making extensive training unnecessary. 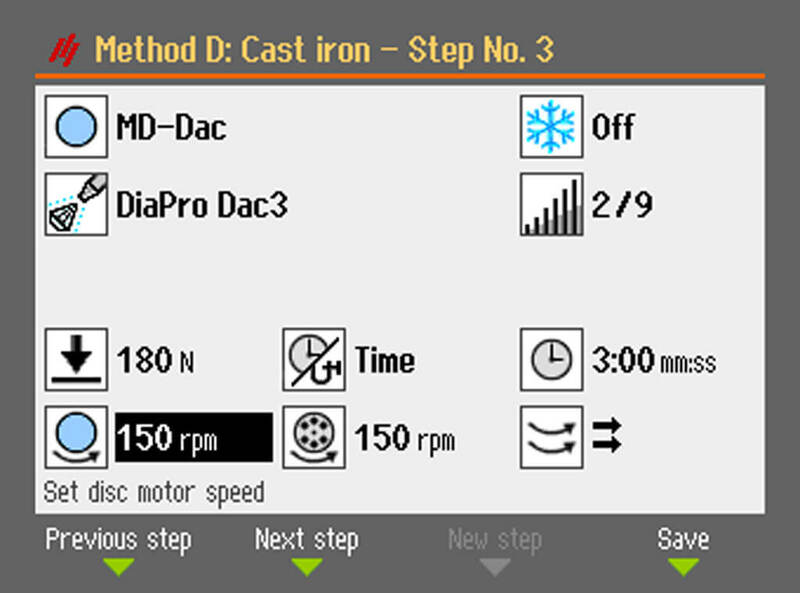 A large clear display with large icons offers the operator a perfect overview of process parameters. The multipurpose turn/push knob makes navigation easier than ever and a countdown feature allows the operator to see the remaining preparation time or remaining material removal. An important factor to obtain a reproducible preparation result is equal dosing of the suspensions and lubricants. To lower the dosing tolerances the AbraPol-30 DP-Pump units can be calibrated by following a special calibration procedure included in the software. 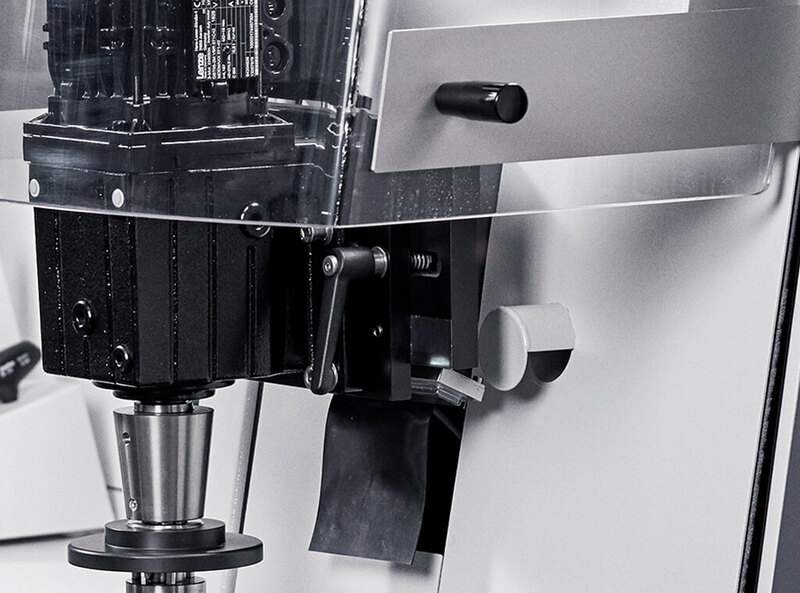 Advanced semi-automatic machine for grinding and polishing of specimens in specimen holders up to 200 mm/8” dia. A removal rate sensor and a transparent safety cover are included. Suspension/lubricant and oxide suspension pump units, recirculation cooling tank, pump and filter, grinding/polishing discs, and specimen holders are available separately. Advanced semi-automatic machine for grinding and polishing of specimens in specimen holders up to 200 mm/8” dia. A removal rate sensor, a transparent safety cover, and a shift valve for recirculation or drain are included. Suspension/lubricant and oxide suspension pump units, recirculation cooling tank, pump and filter, grinding/polishing discs, and specimen holders are available separately. Struers’ equipment conforms with the provisions of the applicable International Directives and their appurtenant Standards. 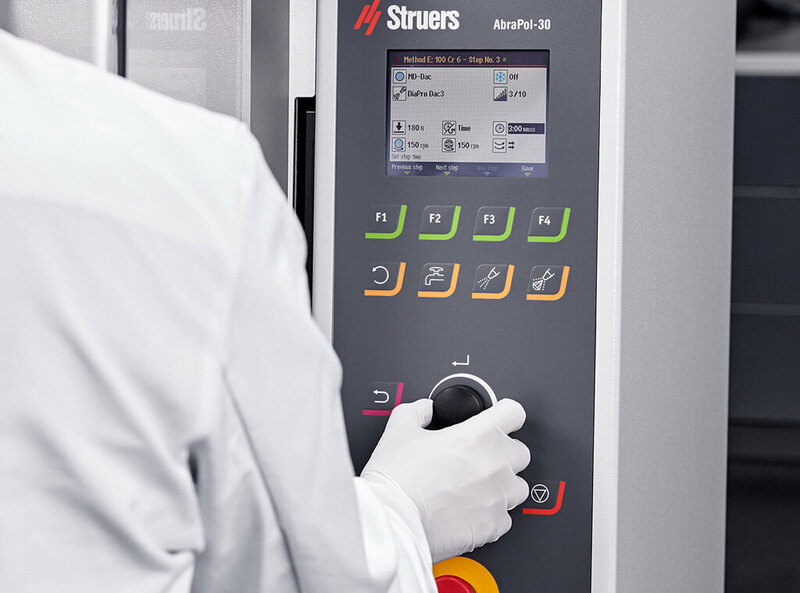 Struers’ products are subject to constant product development. Thus, we reserve the right to introduce changes in our products without notice.